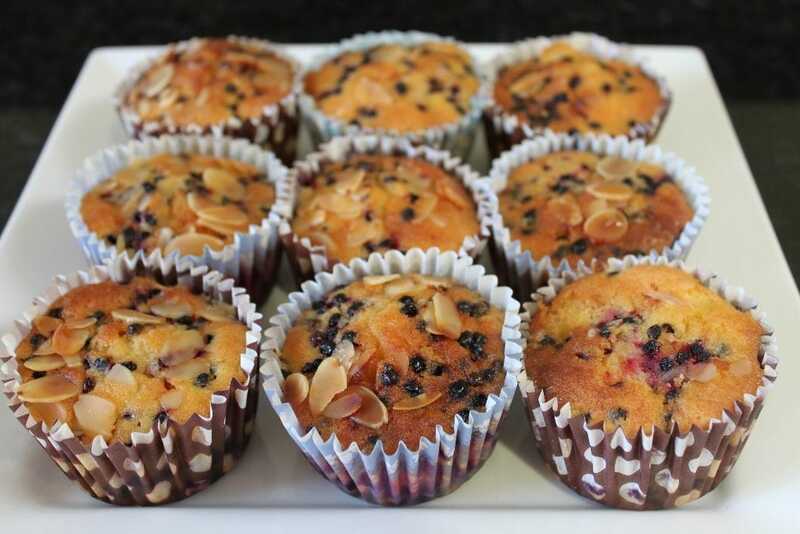 Set oven to 180C/Gas 4/fan oven 160C and line muffin tin with paper cases. Cream the butter and sugar together until light. Gradually beat in the eggs, adding a little flour towards the end to prevent curdling. Beat in the lemon zest, then fold in the flour and almonds. Fold in enough lemon juice – about 3 tablespoons – to give you a good dropping consistency (the mixture should drop easily from the spoon when tapped). Fold in three quarters of the elderberries and spoon into the paper cases so that they are approx ¾ full. Smooth the surface, then scatter the remaining fruit on top (it will sink as the cake rises) and decorate with flaked almonds. Bake for about 20-25mins or until firm to a gentle prod in the centre. A skewer pushed into the centre should be clean when removed. Meanwhile make the syrup: put the lemon juice, zest and sugar in a small saucepan. Put over a gentle heat and stir, without allowing to bubble. The sugar should dissolve a little. As soon as the cupcake come out of the oven, prick all over with a skewer then spoon the syrup over it. Allow to cool completely. Mix the icing sugar and lemon juice together and drizzles over the cupcake.